Scleroderma is a mysterious ailment that appears to sail under the radar with very little media interest and extremely poor medical support. Scleroderma is an autoimmune illness that results in creation of fibrous tissues as an effect of an inflammatory process. In other words, we can say that scleroderma is lined up when your immune system or antibodies strike different connective tissues throughout your body. It is a group of chronic skin diseases which are closely associated with hyperactive immune system. The connective tissues are the fibers which provide the support and framework for the body. Scleroderma is the autoimmune disease of connective tissues. In scleroderma, due to formation of scar tissues (fibrosis) in the skin, connective tissues become hard and thick. As it is an autoimmune disease, the immune system starts attacking its own body resulting in scleroderma. Scleroderma is a progressive and long term disease. It worsens over a period of time. This disease can cause changes in muscles, skin, and internal organs. As a result of the activation of the immune system in sufferers, the innermost layer of small blood vessels and the tissues get traumatized resulting in the formation of scar tissue and accumulation of excess collagen. What is the prevalence of scleroderma? Scleroderma’s occurrence entirely depends upon person to person. Women are most commonly affected rather than males. It most commonly seen in 20-40 age. The exact etiological factor of scleroderma is unknown. It is an autoimmune disease in which immune system becomes hyper active that stimulates cells in connective tissue resulting in production of much more collagen resulting in thickening and scarring of the tissues. In genetically predisposed individuals, some environmental factors such as organic solvents, viral infections and radiation therapy may also lead to development of scleroderma. What is the classification of scleroderma? It most commonly affects the skin but can also involve muscles, bones and joints. Internal organs are not affected in this type of scleroderma. Symptoms involvemorphea (hard oval shaped patches on the skin), streaks or bands of thickened skin on the arms, face and legs. 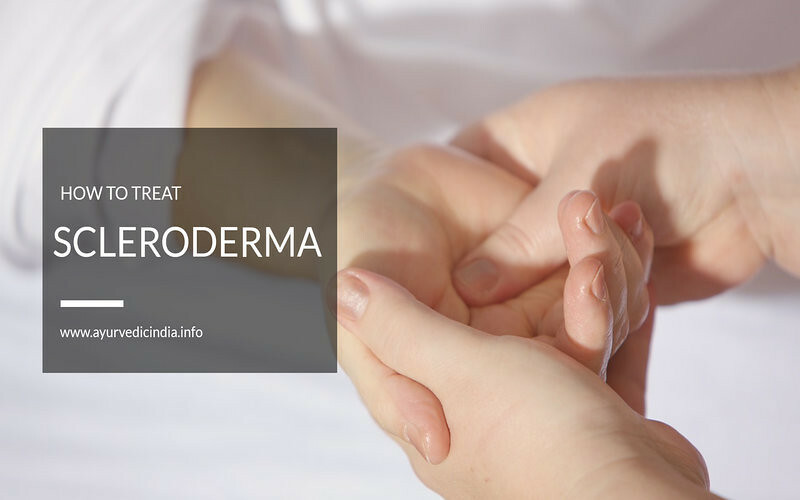 Systemic scleroderma– instead of mild, it is the most serious form of scleroderma which involves skin, joints, muscles, blood vessels, kidneys, heart, lungs and many other organs. Problems of the oesophagus (the tube which connects the throat to the stomach). What are the signs of scleroderma? Thick and hard skin which appears smooth and shiny. It occurs most commonly in winters and toes and fingers turn red, blue or white. This is also known as raynaud’s phenomenon. Ulcers or sores on the tips of the fingers. Red spots appears on the chest and face. As scleroderma can affect various sites and can take so many forms, it is difficult to diagnose the scleroderma. Physical examination, blood tests, imaging studies such as CT scan of lungs and echocardiogram of heart can be done to reach at the diagnosis. Biopsy of skin can be done to confirm the diagnosis of scleroderma. What is the Ayurveda view of scleroderma? As it occurs due to imbalance in the 3 doshas leading in disruption of twak, raktadhatu, mamsadhatu and ambhu. This disease can be managed by maintaining the balance in between the doshas. It is also known as purified sulphur. It is an effective, safe and natural remedy to use in the scleroderma. It helps in retaining the healthy skin. It helps to fight against various bacterial and skin infections. Its properties of absorption of moisture from the environment into the skin. It helps in bringing out the healthy skin from below and hence, helps in getting rid of the dead skin from the body. It is a potent herb and helps in getting rid of several skin disorders. Neem acts as anti-inflammatory, blood purifier, best anti-allergic to eradicate the skin diseases like scleroderma. Its anti-inflammatory properties helps in reduction of pain and inflammation which are the main symptoms to treat disease like scleroderma. Neem has anti septic and healing properties. Boil neem leaves in water and bath with the same water on daily basis will help in treating symptoms of scleroderma. It is also a wonderful herb to treat the symptoms of scleroderma. This herb helps in removing toxins from the body. It helps to treat the body fatigue by removing the accumulated toxins in the body. It also helps in strengthening the body. Turmeric contains curcumin which is pure extract of the herb. It helps to treat scleroderma by increasing the blood supply to the joint tissues, supporting immune system. It has the ability to fight inflammation. Hence, helps in treating scleroderma. It helps in maintaining healthy circulation and also helps in detoxification of the body. It helps in maintaining the balance between the three doshas of the body. It gives strength to the body. Author Bio – This article is written by DR. Vikram Chauhan (MD – AYURVEDA). He is an expert Ayurvedic practitioner based in Chandigarh, India and doing his practice in Mohali, India. He is spreading the knowledge of Ayurveda (Ancient healing treatment), not only in India but also abroad. He is the CEO and Founder of Planet Ayurveda Products, Planet Ayurveda Clinic and Krishna Herbal Company. scleroderma is chronic illness that does not go away. It means it lasts for your lifetime like high blood pressure, diabetes, psoriasis, heart disease, and scleroderma but can be managed. Looking great work dear, I really appreciated to you on this quality work. Nice post!! these tips on curing scleroderma with diety, it is going to help the people related to it.